The Tarmac Sport provides all the complete performance of a FACT 9r carbon frame and fork, coupled with the versatile shifting and solid braking performance of a Shimano 105 11-speed build kit. The Tarmac Sport is the perfect bike to grow along with you as you explore the open roads ahead. >The FACT 9r carbon frame has all the stiffness and performance you need in a lightweight package, making climbing and descending the best part of any ride. >The FACT full carbon fiber fork provides incredible front end stiffness and steering input for rapid accelerations and speedy descents. >The classic and durable construction of the AXIS 2.0 wheelset provides excellent performance in a package that can withstand years of riding and racing over any terrain. Specialized FACT 9r carbon, FACT construction, compact race design, 1-3/8" lower bearing, OSBB. Specialized FACT carbon, monocoque, OS race for 1-3/8" bearing. 1-1/8" upper, 1-3/8" lower, integrated Cr-Mo cartridge bearings, 20mm cone spacer, w/ 20mm of spacers. 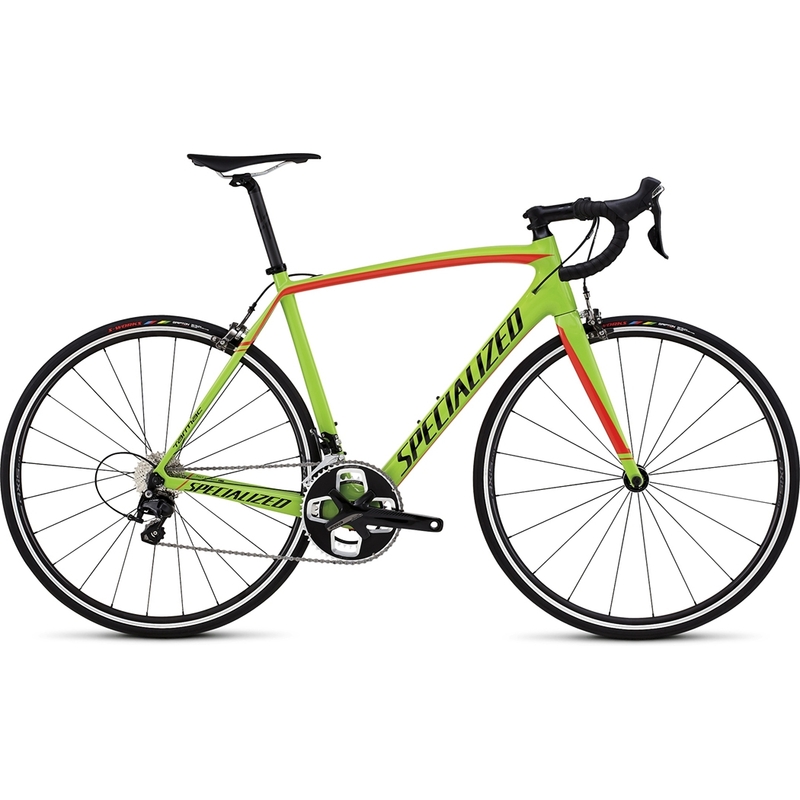 Specialized Comp Multi, 3D forged alloy, 4-bolt, 12-degree rise. Specialized Comp, shallow drop, alloy, 125mm drop, 70mm reach. FSA Gossamer Pro, BB30, 52/36T. Nylon, loose ball bearings, w/ reflectors. S-Works Turbo, 120TPI, folding bead, BlackBelt protection, 700x24mm. Body Geometry Toupé Comp Gel, hollow Cr-Mo rails, 143mm. Specialized Comp Carbon, single bolt. 49.0 52.0 54.0 56.0 58.0 61.0. 505mm 526mm 543mm 564mm 591mm 612mm. 386mm 386mm 387mm 395mm 402mm 408mm. 100mm 120mm 140mm 160mm 190mm 210mm. 72.25° 73° 73° 73.5° 73.5° 74°. 270mm 270mm 272.5mm 272.5mm 274mm 274mm. 72mm 72mm 69mm 69mm 68mm 68mm. 63mm 58mm 58mm 55mm 55mm 52mm. 368mm 368mm 368mm 368mm 368mm 368mm. 44mm 44mm 44mm 44mm 44mm 44mm. 575mm 576mm 582mm 591mm 607mm 614mm. 405mm 405mm 405mm 405mm 407mm 410mm. 970mm 970mm 977mm 987mm 1004mm 1014mm. 517mm 537mm 548mm 565mm 583mm 601mm. 730mm 755mm 775mm 795mm 826mm 850mm. 460mm 490mm 510mm 530mm 550mm 580mm. 75.5° 74° 73.5° 73.25° 73° 72.5°. 400mm 420mm 420mm 420mm 440mm 440mm. 75mm 90mm 100mm 100mm 110mm 110mm. 170mm 170mm 172.5mm 172.5mm 175mm 175mm. 400mm 400mm 400mm 400mm 400mm 400mm.